Award winning social BBQ’s of all types and sizes, including Bar Mitzvahs, Bat Mitzvahs, anniversaries, birthdays, family reunions and graduations are the events you host but want to enjoy and party. 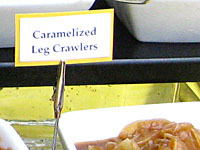 Smoke & Spice gives every event specialized attention. Our event planning team can meet with you to personalize the location, cuisine, drinks and decor for your next social event. Throughout our many years of experience we have developed relationships with rental companies, florists, entertainers and unique venues in order to better serve our clients. Whether you are looking for an intimate event for friends or a charity event for thousands of guests Smoke & Spice BBQ catering works hard so you don’t have to. Call today to make an appointment with an experienced Miami special events catering event planner. We had so much fun planning the Frank Bat Mitzvah. Mike the dad is the best and such a joy to work with! He really trusted us to take the theme and run with it. And run with it, we did! 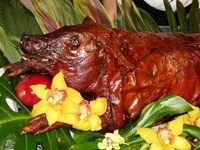 This Coconut Grove Luau Party had a Kahlua Pig as its main culinary delight. This small private catered affair was hosted at a beautiful home built in the early 1900’s. Smoke and Spice provided hors d’oeuvres and tropical cocktails wile guests arrived and later served a tropical luau buffet. The evening was finished off with coconut Carmel flan for desert that everyone raved about. Mr. Gallo celebrated his 40th birthday with a catered Cuban style pig roast and a 1980’s rock band. The menu consisted of a Cuban style pig roast, barbeque chicken, black beans, white rice, plantains, house salad and freshly baked rolls. 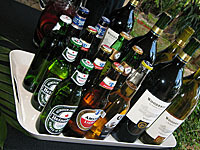 We setup a bar serving beer, wine and sangria. Winston was an absolute delight to work with. The food was very important to him and we jumped at the chance to give him everything he was looking for and more! It was a gathering of good friends and family where people could relax and enjoy the food, conversation, and the perfect South Florida weather. The menu had a tropical theme with favorites like Kahlua pig roast, guava glazed ribs, jerk grilled chicken, red beans and rice, real deal cole slaw. Prior to dining we passed an assortment of hors d’ oeuvres’ which included Thai beef skewers, conch fritters, Florida firecrackers and cucumber cups with a roasted corn and black bean salsa. Decor was simple with a tropical feel. 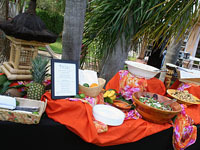 Smoke & Spice was honored to be a part of this Fort Lauderdale catered event. We were asked if we could come up with a theme for a kid’s party similar to the game show Fear Factor and we took it from there! Our food ranged from gourmet Black Angus beef burger station with premium condiments and toppings to freshly prepared pizza, our famous macaroni and cheese, plump all beef Hebrew National Jumbo Hotdogs and cones of French fries. These kids had a blast dancing and competing in games into the evening as the adults enjoyed wonderful food and laughter. Celebrating a special birthday is a great excuse to bring your close friends and family together. 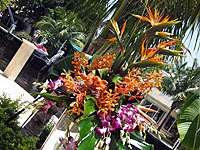 The tropical landscaping of this backyard was the perfect setting for a luau theme birthday party. The natural green foliage, exotic tropical flowers, bright and colorful linens and a Kahlua Pig Roast that was simply to die for, just took this event to the next level. Add our award winning ribs and juicy BBQ chicken to the mix and the guests just could not have enough. Our carefully prepared bow tie pasta salad and homestyle side dishes were just icing on the cake. What an enjoyable evening! Hunters parents had Smoke & Spice cater his baby shower the year before, now a little over a year after the shower we were asked to cater his birthday party south beach style. 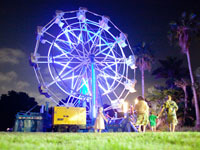 The party include a gourmet coffee bar for the adults, wild life show and our award winning barbeque. The Saffran’s are a real pleasure to work with and we thank them for there continued support. The menu included wood roasted chicken, thick sliced Texas style beef brisket, Jumbo Hebrew National Hotdogs, Sizzlin’ Angus Beef Burgers, with premium condiments, petite corn on the cob, Maple bacon BBQ beans, Real deal creamy coleslaw, baked redskin potato salad and a boatload of hospitality. The team at Smoke & Spice really enjoys being part of a Miami special events catering company.